The ibis Styles Villeneuve sur Lot hotel is located in the new Romas district, near the new hospital, only 18.6 miles (30 km) from Agen. We have stayed here 3 times because of the staff, cleanliness of the room and inclusive of breakfast. A welcome place to break our journey. This Ibis is well placed with views of the countryside at the back. It has enclosed private parking and is ideal for the traveller. We had a warm and helpful welcome and were very happy with the ambiance of the hotel. The room was a bit small but very adequate for one night and we would happily have stayed longer. The bathroom, on the other hand, was of a very generous size. Everything was very clean. This was a very welcome rest for the night. The hotel had secure parking and was easy to access. Unlike many, it was in a fairly open area, looking onto fields at the back. The staff were friendly and helpful, it was in easy reach of Villeneuve-sur-Lot for exploring the town. The rooms maybe a bit small for longer stays but are very clean and comfortable. We would certainly stay there again. Dear, We thank you for the notice you left on our hotel. We are delighted that you enjoyed your stay. Also, we will not fail to share your appreciations with our entire team. We hope to welcome you again very soon. Please accept, Madam, Sir, our best regards. Pleasent reception staff, great room and facilities . Very good, quiet and confortable. Lovely breakfast. Very good, quiet and confortable. Lovely breakfast. We were worried as soon as we got there because there is a large McDonalds just in front and a restaurant and bar share the building, but as soon as we parked in the secure parking in the back and entered the hotel everything was quiet. The room was nice and comfortable. There is something to be said about the large rugby player photo by the bed, but thats just me being picky. Breakfast was lovely, with freshly squeezed orange juice, fresh fruit. Above our expectations in every way. Hotel was OK and staff good in the evening, helpful. Welcome drink, a half litre of cristaline was pathetic. Then to find sugary sweets and drink in the room was a real shock. Give people a proper bottle of water not a load of junk full of additives. Disappointing breakfast with no gluten-free option. Nobody at check out so I left my key- I am still waiting for my bill and points to be put on my fidelity card. Great quality, service, team, super clean! We were a 17 room group and all had a great experience. All guests are from the United States and used to high standards. 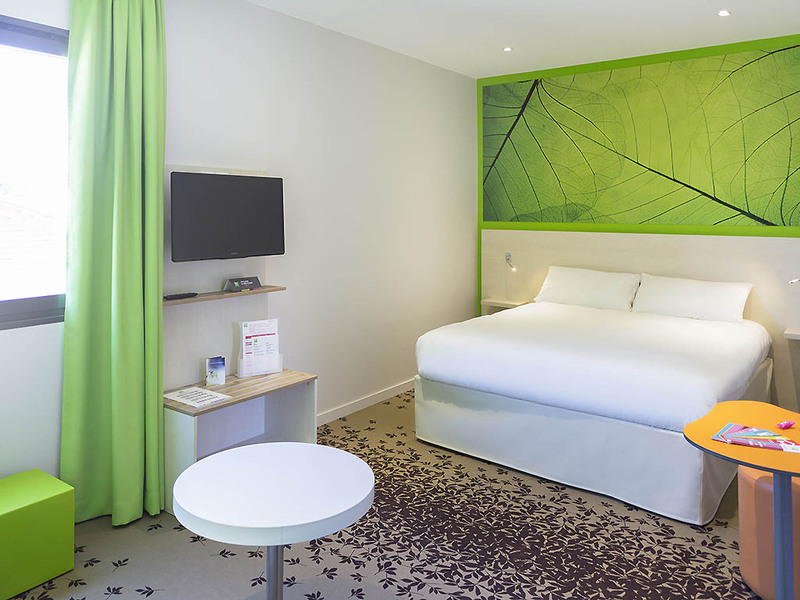 The Ibis Villeneuve sur Lot Team was super accomodating and understanding of our guests needs. Rooms were very clean, AC was in every room. Our group had a wonderful time and look forward to their next stay. Our first bad experience of an Ibis hotel in France, during 50+ nights over recent years. Quite surly receptionist at check in. The hotel is very tired, the room was dark and tatty with mould on the patio door and a shower over the bath. The sound insulation was also poor. The menu on the website stated a vegetarian meal option was available, but it wasn't. The breakfast buffet was poor, with no knives, the fruit salad had run out and the staff seemed more interested in socialising together than keeping the buffet stocked. Overall a very disappointing experience and we will never use this hotel again. Very easy to find with friendly staff comfy beds and good choice at breakfast.. I stay here a lot as I visit my mother who is in care in VSL. It is therefore very practical for me. Ibis Styles provides comfortable and affordable accommodation. Very friendly staff on arrival, who organised the air-con because it was very hot that day. The room was light and airy and very clean. The bed was comfortable and the shower was good. We ate in because we had travelled a long way and we were tired but the menu was very restricted. What we had, however, was acceptable. Breakfast was good and I loved the choice of a large cup for my breakfast tea!! It was very quiet overnight and we slept well. Would definitely return. Very relaxing due to safe easy parking- cleanliness - pleasant & helpful staff. The hotel was easily located - in very pleasant surroundings Internet connection was essential for us and was readily available. Our room was very pleasant and clean and the reception/restaurant staff always eager to help.